THIRTY-FOURTH REPORT of the Committee – consisting of the Rev. S. Baring-Gould, Mr. R. Burnard, the Rev. J. F. Chanter, and Mr. B. Hansford Worth (Secretary) – appointed to collect and record facts relating to Barrows in Devonshire, and to take steps, where possible, for their investigation. Your Committee’s report again has reference to Dartmoor and, on this occasion, to remains in the Plym Valley. In the Twenty-sixth Report (1907 – xxxix. p. 83) will be found a description of a rifled kistvaen in the Drizzlecombe valley, of which a plan and view are also given. The location is lat. 50° 29′ 22″ N., 3° 59′ 5½” W.
In August last this kistvaen was thoroughly examined, the interior being cleared out to the full depth of the side stones. A few fragments of charcoal were found, no interment pit could be traced. The depth of the original floor below the top of the side stones proved to be 32 inches. A stone circle, of which only about one-half of the circumference now stands, lies 675 feet or thereabouts distant from the large cairn known as “Giant’s Basin”, and in a direction somewhat west of north therefrom. It will be found marked on six-inch Ordnance Survey of Devon, sheet CXII, S.E., in Ion. 3° 59′ 9½” W., lat. 50° 29′ 11½” N. It is one of the outlying members of the Drizzlecombe group, having as nearest neighbour a large kistvaen eighty yards or thereabouts to the north, which has been described and figured as “Drizzlecombe, northern”, in the Nineteenth Barrow Report (XXXII, 1900). The stones of the circle stand but a few inches above the level of the ground, and are so nearly of one thickness, so level along the top, and so close set as to give the idea of kerbs. The ground within and without the circle was at the same level prior to excavation, there being no trace of any mound. The internal diameter of the circle is 11 feet. On the 13th August, 1914, the circumference of the original circle was marked out as nearly as it could be restored by reference to the half yet remaining, and the area thus defined was cleared and excavated. Immediately below the turf were found the stones of a cairn, and these extended as a layer some foot in thickness down to the subsoil or calm. All meat earth had been cleared from the interior of the circle before these stones had been deposited. Almost certainly the “kerb” is the retaining circle of a former small cairn, which has been robbed, and has thus lost its characteristic form. The tops of the stones of the circle stand from 15 inches to 20 inches above the calm or subsoil. In excavating and removing the stones of the cairn three flint fragments were found, all evidently flaked by hand, but having no recognised implement form. In addition to these a well-finished knife or scraper was discovered. This has a rounded contour for the most part, but about one-third of its worked edge is more nearly straight; only about one-fifth of the margin is free from secondary chipping, and this is at the thicker end, where the “bulb” of the original flake occurs. The greatest diameter of the implement is 55 mm., and its least is 44 mm. ; the average thickness is about 6 mm. Figures 1 and 1a are from photographs of the two sides, and are the same size as the original. A little charcoal was found on the surface of the calm. There was also disclosed an interment pit, but its excavation only yielded traces of charcoal. This pit lay 3 feet south of the north margin of the circle; it was irregular in shape, extending about 36 inches east and west, having a width of 20 inches north and south, and a greatest depth of 18 inches below the surface of the cairn. 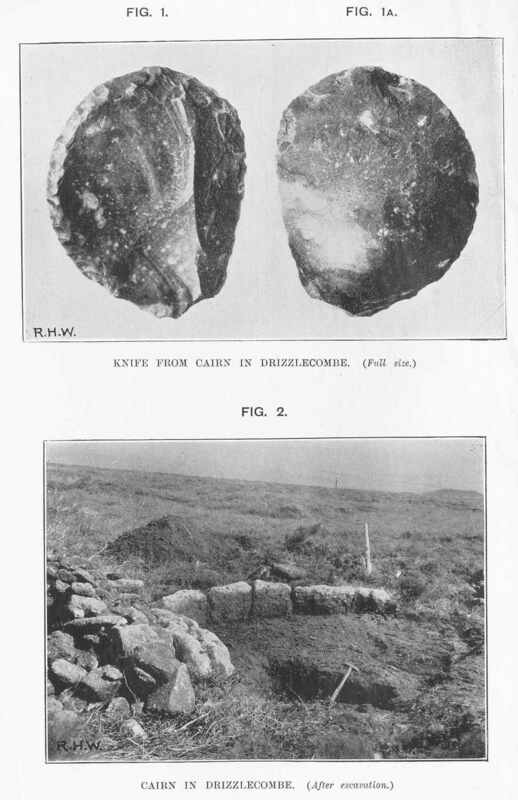 Figure 2 is a view of the circle after the excavation had been completed, and before refilling. The immediate foreground is a portion of the grass and heather surface outside the circle. Over and beyond this is seen the interment pit, from which the handle of a small spade projects. Between the interment pit and the stones of the circle lies the bared surface of the calm or subsoil. To the left of the photograph is a heap of stones which were taken out from within the circle, between the grass and the calm. To the right of this heap, one stone, against which the others are piled, is the near end stone of the portion of the circle yet remaining, the whole of which is included in the view; a mound which shows a little behind the retaining circle is earth thrown out in the course of excavation. In the distance, at the right of the photograph, will be seen the cairn known as “Giant’s Basin,” and somewhat to the left of this, on the crest of the same hill, the largest of the Drizzlecombe menhirs. There is no sky in this view, the rest of the space above and beyond Giant’s Basin being occupied by the hillside of the southern bank of the Plym. There were present at the examination of this circle the Rev. H. Breton, R. Hansford Worth, and Mr. Brown, of Sheepstor.